Uninterruptible Power Supply, known alternately as UPS, helps preserve the power supply for your essential processes even during power shortages. When choosing this solution for your business, though, you may run into the conundrum of which to pick: single or 3 phase UPS. What will best meet your needs depends on several factors. The most pressing matter affecting your need for either single or 3 phase UPSs is how damaging equipment failure will be to your day to day operations. For example, smaller businesses dealing with minimal PC loads can often get away with using single phase Uninterruptible Power Supply because the data they store may not necessarily stop the business in its tracks or cause a costly shut down of all operations. A single phase UPS usually utilizes offline or line interactive strategies to complete its job, and the small interruption of power allowed by this does not usually affect work areas that are not centralized. By contrast, 3 phase UPS is usually necessary when equipment failure is not an option. The way 3 phase Uninterruptible Power Supply works allows for a completely gap free transfer between battery power and internal bypasses, which can be a critical part of avoiding equipment failure. The fact that the system works online adds to its reliability. In addition, for loads that are above a certain limit, 3 phase UPS is often more utilitarian. 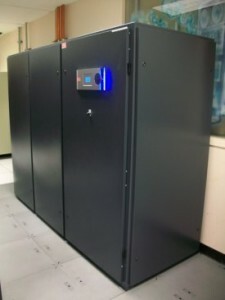 The way the facility you are using is engineered also dictates what kind of Uninterruptible Power Supply is right for you. In general, you will find that the larger the building, the more likely it is that it has been configured for 3 phase UPSs rather than single phase UPSs. If your facility is equipped to handle a 3 phase UPS, then you will need to make sure that the load is distributed evenly through the electrical grid to avoid unbalancing the system. Keep in mind that every time you add to the load in the future, you may need to revisit this issue to keep the balance intact. To make the smartest business decision, consider price and capacity in the decision making process. The smaller the capacity and the UPS, the lower the cost. Single phase UPSs routinely cost less than 3 phase UPSs, and the available capacity of each also varies. As you calculate the amount of energy your system needs to be capable of delivering, remember that your needs may change as you expand. To make the most informed decision, talking with an expert can help you understand the possibilities available for your business and help you choose the right solution for your Uninterruptible Power Supply needs. This entry was posted in Uninterruptible Power Supply and tagged Uninterruptible Power Supply, UPS Systems. Bookmark the permalink.